A gorgeous quilt in a gorgeous setting! I very nearly hive crashed your hive when you asked for that block because I thought it was a lovely idea. I did not have enough time then. Your quilt turnrd out just stunning. I love it. The photo setting is brilliant too. Oh you're making me covet this quilt. All! my favorite colors! Beautiful! So looking forward to the Stash Bee this year! A beautiful finish for 2016. Great finish just in time! Your work is super cool. When you say theater I envisioned something like Ford Theater, but wow. It really makes a great backdrop to your pretty quilts. 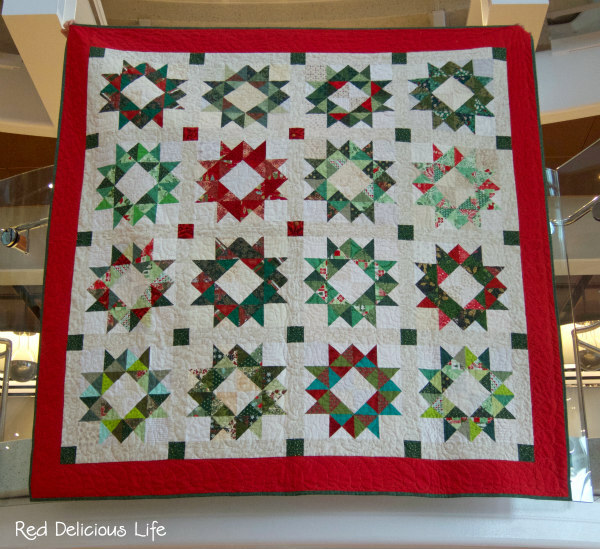 This is such a gorgeous festive quilt and an amazing setting for some great photos. Enjoy snuggling under this beauty. Hello, my Hive Momma for 2017! Love this post above because 1, it's an awesome quilt, 2 great photo venue, and 3 a three-fer on the goals! Well done on finishing your Stash Bee quilt in the same calendar year. You now have a clean slate to start next year's bee project. I'm crazy about this finish! This design would be the perfect way to blow through some of my Christmas scraps. Any update on the bleeding problem? I hope you were able to remedy it! This is so beautiful! I love all the wreaths together! Great block choice. I liked your idea so much, I'm going with something winter-y for my 2017 Stash bee block. Fantastic finish! This is so lovely - and I still love the setting you have for your quilt photo shoot. The only thing I will say is that you have now made me question my choice of Stash Bee 2017 block!!! I had mine all ready but now I think that I would like to go with this one ..... still a couple of weeks to decide. Beautiful finish! I love how fun and scrappy it is. Your pictures are wonderful too! What a lovely quilt. And yea for finishing a quilt. WOW! What a beautiful building to take pictures in. Are you continuing OMG for 2017? I find it very motivating for me. The perfect backdrop for a pretty quilt. What a lovely holiday quilt! 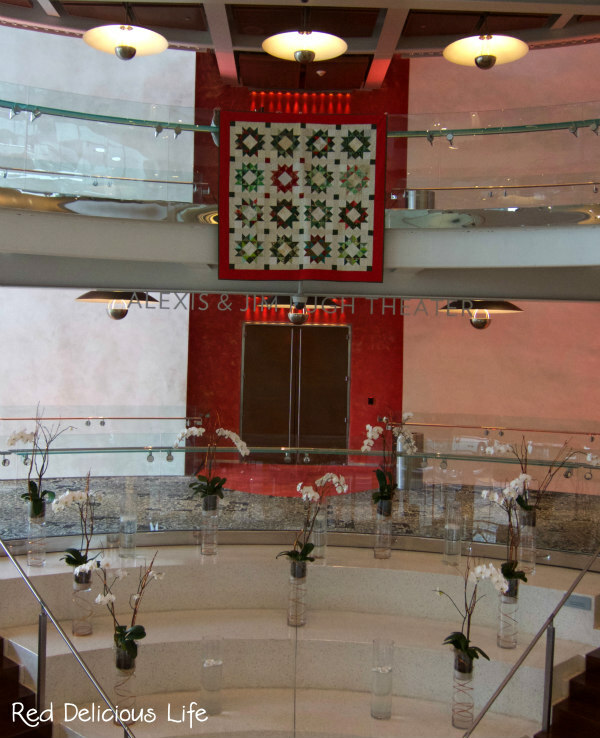 The lobby of your performing arts center is the ideal "gallery" to show it off. 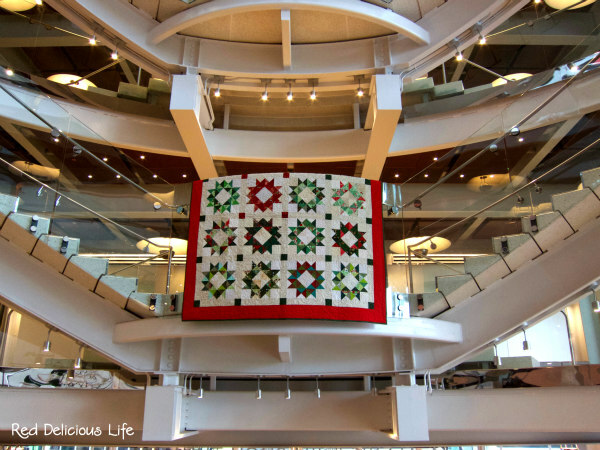 What an amazing way to showcase a quilt. It's a very special quilt if it includes all your bee friends! Looks stunning and you can look forward to getting it out every winter. Congratulations on the finish and thank you for participating in the 2016FAL, on behalf of all the hosts! It's stunning and I love your photos!